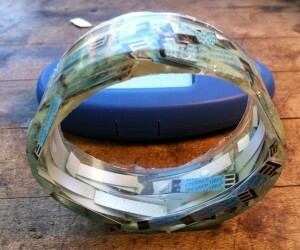 Thanks to Diabetes Art Day 2012, I expanded my designs for a OneTouch Ultra cast resin ring, to a series of used test strip rings and then OneTouch Ultra bangle bracelets. 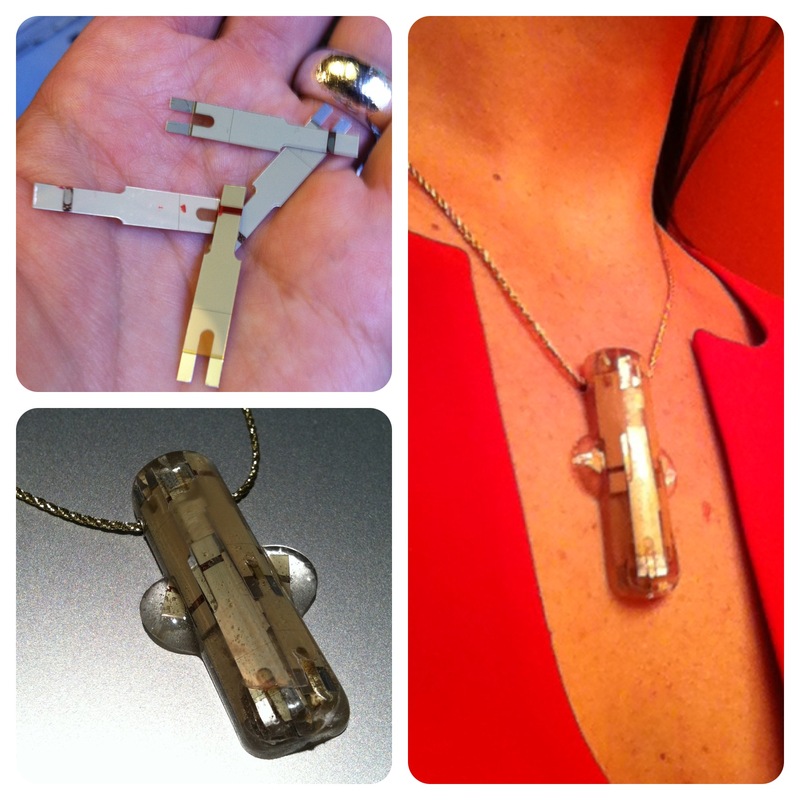 In December I discovered my health insurance covered the Verio IQ meter (and those gorgeous gold and silver test strips have jewelry-potential written all over them plus the meter lights up in the dark). I’ve now completed one necklace, cast using the plastic insert that held my Animas Ping pump securely in it’s shipping container (One man’s trash is another woman’s treasure right?). Some photos of my test strip designs were used by OneTouch on their Facebook page for their coverage of Diabetes Art Day 2012 which was pretty cool. There were people who commented the designs were ugly (I agreed, diabetes can be a really ugly disease) and people who actually thought I was wasting “good” test strips even though I pointed out that they were MY USED strips. We all know the cost of test strips is daunting and we are also well aware of the amount of trash that comes with diabetes. BG testing supplies, pump supplies, Dexcom inserters, and the packaging for all these items. My goal with the jewelry (aside from challenging myself as a designer) is complex. I read Diabetes Forecast’s article on Anatomy of A Test Strip and was intrigued. I see beauty in test strips as not only a life saving device but also beauty as a product of technology, engineering and industrial design (my undergrad degree is in Industrial design and I launched a jewelry design business in 2009). 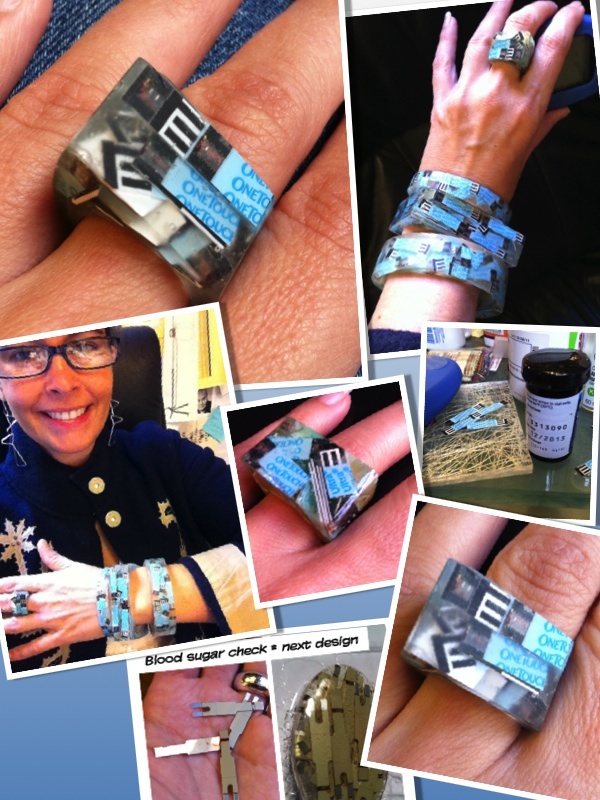 Back to my test strip jewelry goals… I have worn many of the pieces (especially the bangle bracelets on Blue Fridays). I often find them to be a segue to conversations on diabetes much like my “blinged” Dexcom sensor was on my arm this summer. If wearing some of my test strip designs gives me a chance to explain and educate and even bond with someone about diabetes, then great, bring it on. I wore my Angled OneTouch Ultra ring to a T1 meet-up at my local JDRF chapter. A woman came into the meeting, sat next to me and recognized the ring. It was the first time someone said, “You’re Surfacefine”. It was totally weird for me but this was the same woman who had asked about a foot issue months prior on Twitter. I knew she lived in NYC and recommended my podiatrist (who I LOVE) and who also happens to be a fellow T1D. We clicked immediately at the meeting and I was thrilled we got to chat in “real life”. Way to go jewelry! 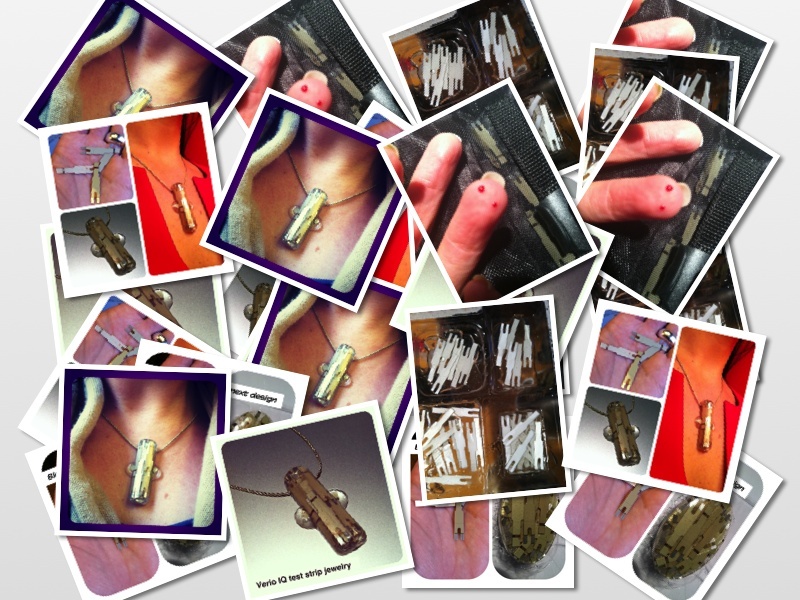 As an artist, making one-of-a-kind jewelry pieces intrigues me. The majority of my professional life involves working in mass production. The combination of mass produced diabetes equipment (specifically all the disposable items that have a one-time use), made into one of a kind mold and a one of a kind layered resin design fascinates me. Since my supplies are used, I am now collecting stuff like crazy (read: I’m a hoarder x10). The finishing work on these pieces is time intensive (which I love). 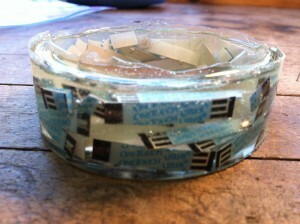 I have 4 molds I am currently pouring and utilizing used pump supplies along with test strips. My used diabetes supplies have become my jewels (please note I still like diamonds). As very special shout to Lee Ann Thill who started Diabetes Art Day, The Diabetes Postcard Exchange and writes The Butter Compartment. You can read more about Lee Ann and her latest projects at her About Me . Wordless Wednesday a few minutes late! This photo looks pretty cool (well I *may* be biased) but regrettably there were some issues with the resin setting. “Boo hoo,” said this creative diabetic. I’m experimenting with some patching and creating some negative space within the design, but I will need to create another (read: start over).